Sean Baxter è coinvolto nella scena della musica improvvisata da oltre dieci anni. Membro fondatore dei Bucketrider (con David Brown e Tim O’Dwyer), dei Lazy (duo con Brown, specializzato in un rumorismo estremo), dei Krayniy Grokhot Terror (trio con Brown e O’Dwyer). Sean Baxter is an Australian drumkit and percussionist improviser who has forged an international reputation as a bold explorer of percussive possibilities both as a soloist and through his work with the avant-garde trio Pateras/Baxter/Brown. Focusing on the use of extended techniques applied to the conventional drumkit, he utilises an arsenal of metallic junk and other percussive detritus to expand the sonic palette of the percussion tradition. A founding member of pioneering Melbourne experimental groups bucketrider, Lazy and Western Grey, Baxter has been an active presence in Australias avant-garde for the past couple of decades both as a performer and curator. 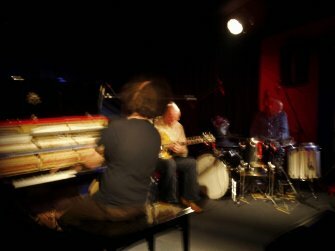 Recently, he is the artistic director of the Make It Up Club, Australia's longest-running weekly concert series dedicated to avant-garde improvised music.